Did you know that one of the bacteria used in yogurt was first discovered in Bulgaria (hence its name lactobacillus delbruecki bulgaricus)? In Bulgarian, yogurt is called kiselo mlyako, which translates to soured milk. Yogurt constitutes an integral part of Bulgarian cuisine. While in North America, it is most often consumed at breakfast, as a snack or a dessert, in Bulgaria, yogurt is used in savoury dishes or on its own. When consumed regularly, yogurt may help in maintaining a healthy intestinal environment, preventing yeast overgrowth and strengthening the immune system. Some studies have even linked yogurt consumption in Bulgaria with longevity. Interesting, is it not? This leads me to introduce you to Vladimir. In my book, Vladimir (aka Bate Vlado) is the Bulgarian yogurt master. Bate Vlado was born in 1926 in Tran, Bulgaria, a small town at the border of Yugoslavia. 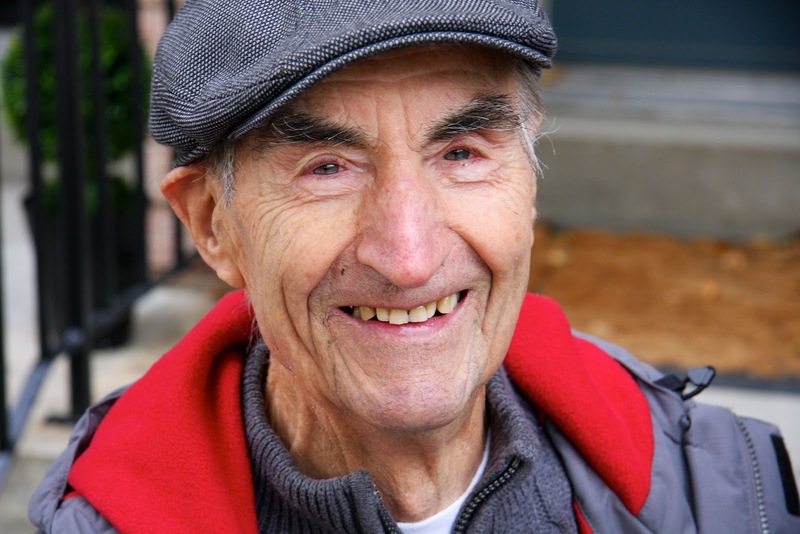 His family lived on a farm, and sold butter and cheese they made from cow, goat and sheep milk. At 18, he left Tran to study in Sofia, and his career later led him to hold high rank positions across the country. A family man first, Bate Vlado took an early retirement to help raise his two granddaughters. In the early 1990’s, after his only son fled Bulgaria due to political instability, he immigrated to Canada with his wife. What struck me when I first met Bate Vlado was the strength of his handshake and his active lifestyle. In terms of character, he can be best described as a man of principles. I’ve had the pleasure to know him for a couple of years and he generously shared with me some of his wisdom. He makes the best yogurt and lentil soup I’ve ever tasted. The following recipe and instructions come directly from him. This recipe yields about 4 liters of yogurt. It may seem like a lot, but having been a yogurt-lover for many years, I eat it every single day at breakfast, sometimes as a snack throughout the day, and frequently in Bulgarian-inspired dishes. Based on my consumption, one recipe lasts me two weeks (the yogurt will keep in the refrigerator for a good three weeks). You can split the recipe in half based on your own needs. While you can make yogurt with low-fat milk, I personally like the texture of yogurt made with whole milk. 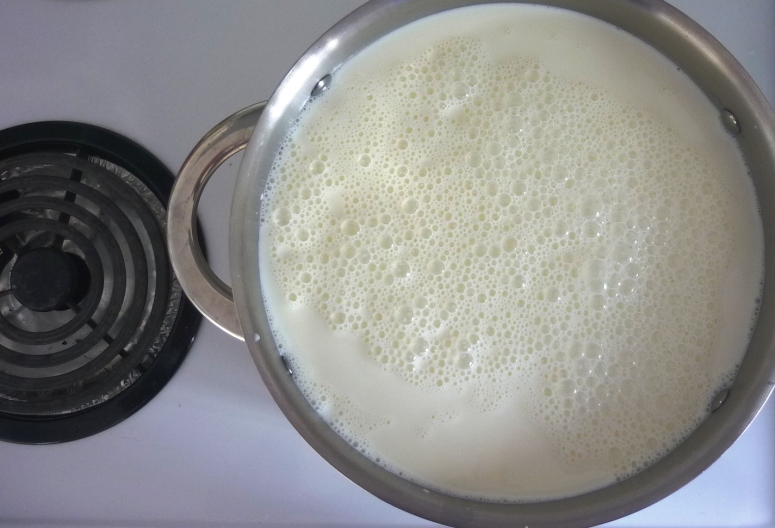 Pour milk into a large pot. Slowly bring it to a boil over medium/low heat, stirring frequently to avoid the milk from sticking to the bottom of the pot. You can cover the pot for the first 20-30 minutes to speed up the process. Meanwhile, measure the yogurt in a large bowl and set aside at room temperature. 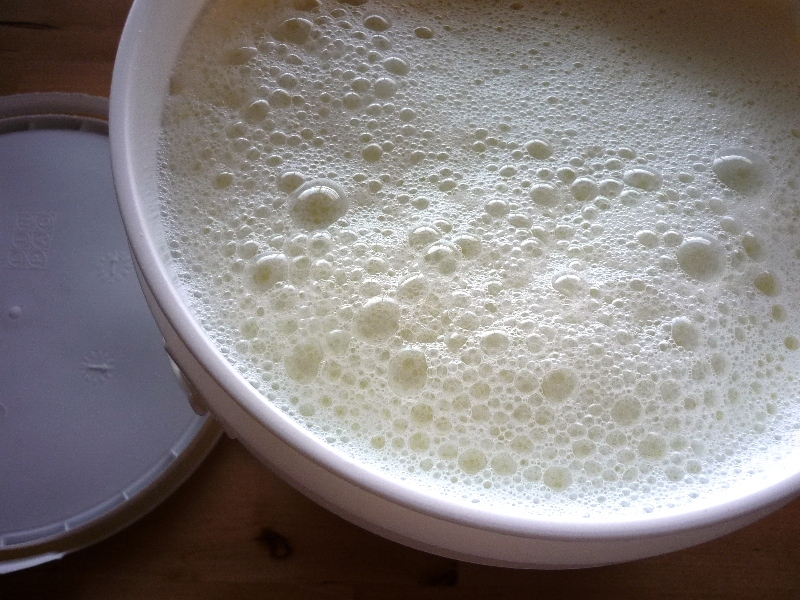 The milk will become frothier as it heats. Stir frequently. When the milk starts boiling, it will rise. Be careful as it may overflow if left unattended. If you prefer using a food thermometer, heat the milk to 180 F. At this point, you can either remove the milk from the heat, or keep it boiling for a couple of minutes, stirring constantly and preventing it from overflowing. 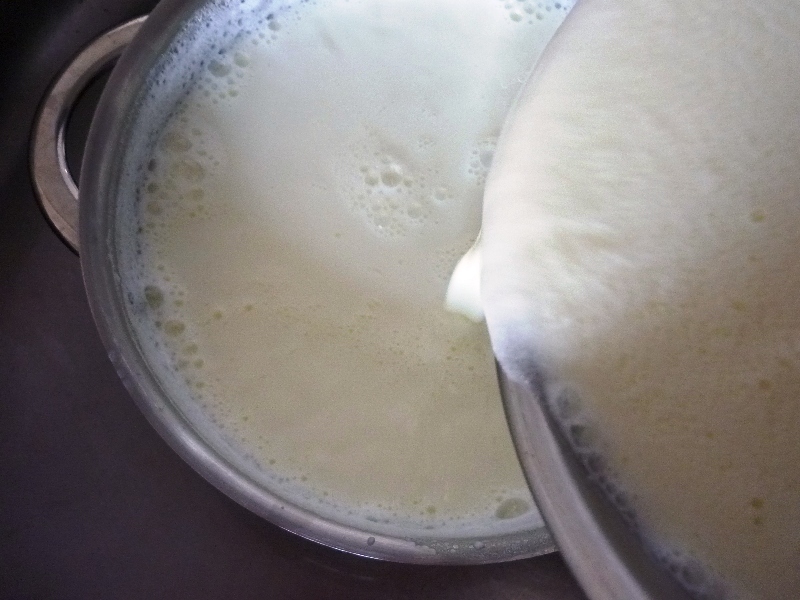 Keeping the milk at high temperature for a few minutes will yield a thicker yogurt. Remove from the heat, and place the pot in a sink filled with cold water to cool it down. 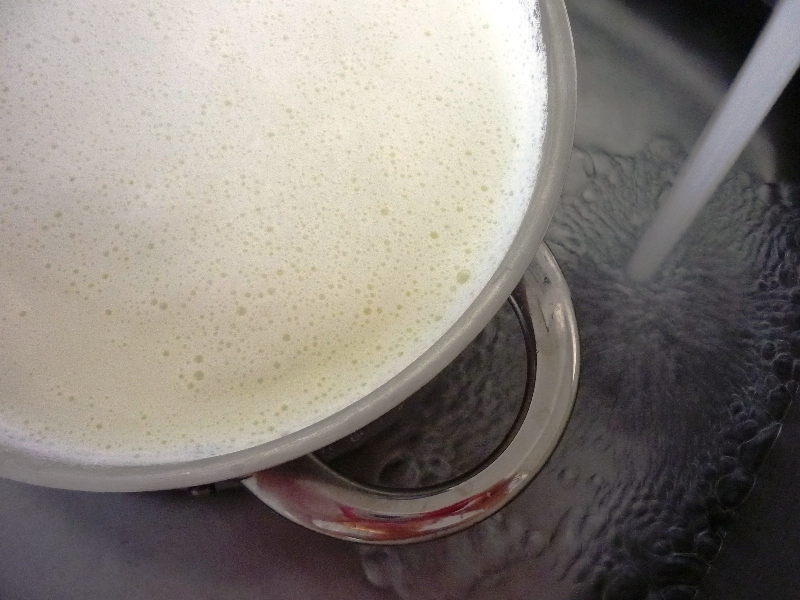 When the milk has cooled down to 110 F, remove the pot from the cold water as it is time to stir in the yogurt *. Another way to see if it’s ready is to test it with a clean finger. The milk temperature should be comfortable for you to keep your finger immersed for a few seconds. If it burns your finger, it’s still too hot. Warning: If you stir in the yogurt while the milk is still too hot, the heat will kill the bacteria and your yogurt will not set. 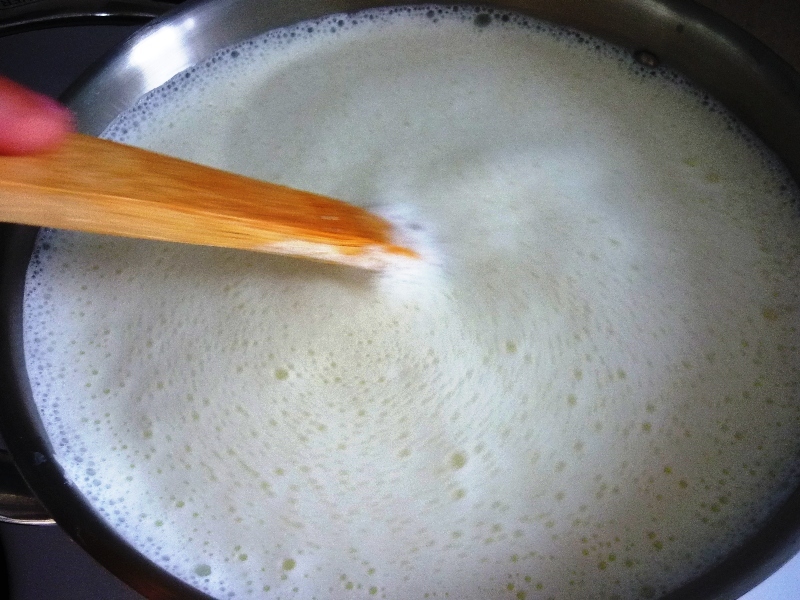 * Before you stir in the yogurt, you want to slowly raise its temperature. Using a ladle, take a spoonful of milk at a time and pour it in the bowl with the yogurt. Mix well and repeat several times. 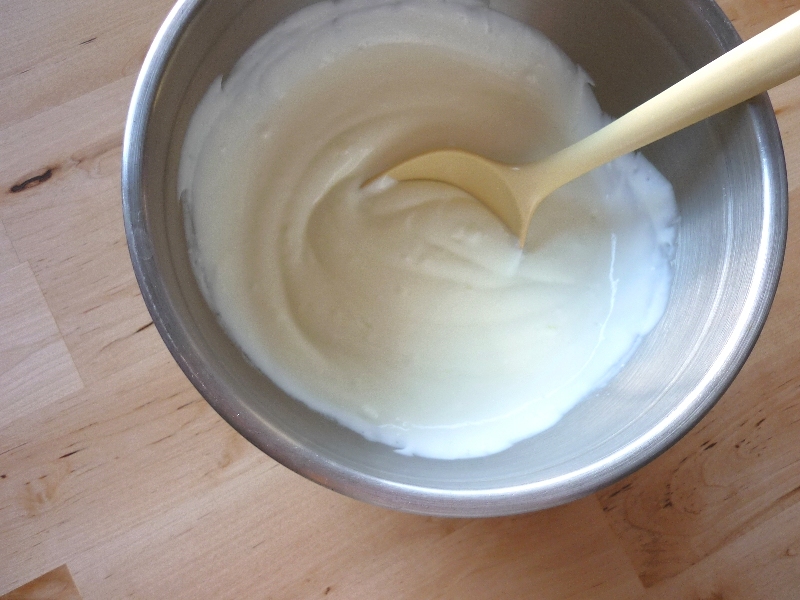 When the yogurt mixture has warmed up and has a liquid texture, pour it back in the pot with the milk. Stir well. It is now time for incubation. 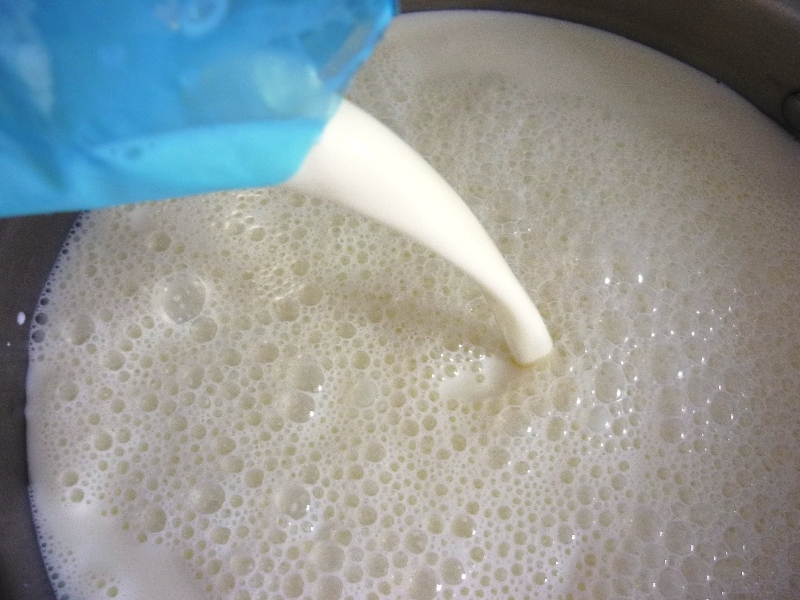 Pour milk into a large container and seal tightly. 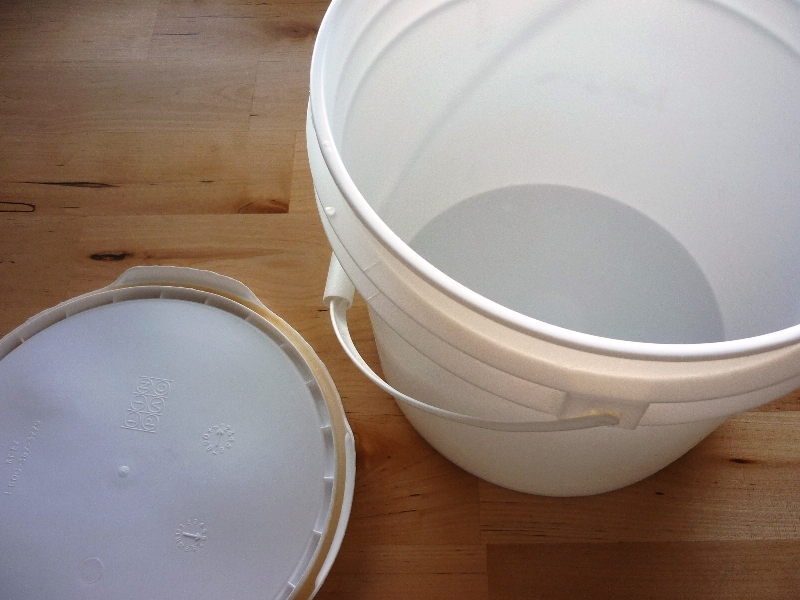 Keep the container in a warm place to allow the yogurt bacteria to multiply. This can be done by placing a warm blanket or winter jacket overtop. 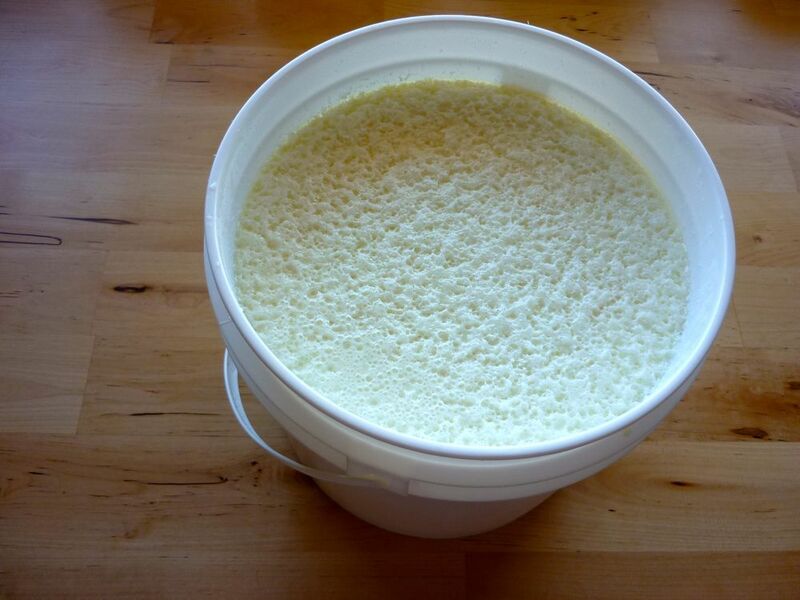 Incubate for 5 to 8 hours, until the yogurt has set and looks like the picture below. Place container in the refrigerator and wait until the yogurt is completely cold before consuming. I know the process can seem intimidating at first, but it is actually very simple. Good luck! I did not believe I can make yogurt, but it is real, it is very good, much better then what I can buy from the store. Thank you! “…let me share a little secret: I am head-over-heels in love with frozen yogurt.” Well, that love can surely make you even healthier. 😉 Yogurt is known for being a good source of antioxidants and a big help in digestion. Also, it has several vitamins that can boost your immune system, thus protecting you from sickness. Thank you – though not sure what you wish to highlight? Where can you find these containers Marie-Eve? Do you know the size, not sure if it will fit in my fridge for the cooling process, but like the type of container your using. Hi Hailey! I hope you are doing well. I was lucky to get this container from someone working in a restaurant.. I believe it was a container for sauce or something. Definitely harder to find in stores, but something out of costco might also do the trick (I'm thinking the largest feta container 3kg at costco). Good luck and thanks for stopping by! Lactobacillus delbrueckii subsp. bulgaricus was first identified in 1905 by Bulgarian sentence – Stamen Grigorov, who named it Bacillus bulgaricus. The Thracians and later the Slavs and Proto-Bulgarians hand down from generation to generation the recipe for health and longevity – the preparation of yoghourt.